Your exciting zip line adventure begins with a safety briefing session. Your guide will lead you on a short hike to the course entrance where you will climb a staircase up to the first zip line launch platform. 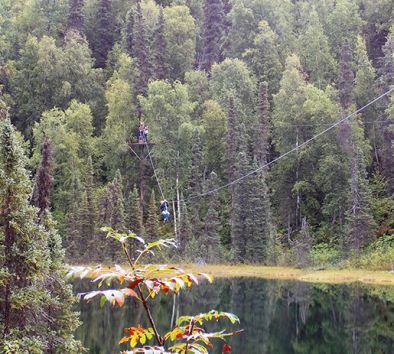 You will have a chance to cross a suspension bridge to view the dramatic vistas of the Alaska Range, the foot of the Ruth Glacier, and the braided Chulitna River valley. The scenery from this view point offers ample opportunity for photographs. Each platform will offer ever changing views of the mountain vistas. The final and longest zipline of the tour will span close to seven hundred feet with most of the ride suspended 15 to 30 feet landing on the final platform six feet off the ground, affording an easy stair exit and a short walk to the pickup destination. Minimum age is 10. Minimum height is 4’0.” Minimum weight is 80 lbs; maximum weight is 270 lbs. Wear comfortable, closed toe shoes. Pregnant women or guests with back or neck problems are not allowed to participate. Waiver must be signed and medical conditions disclosed. Tour operates subject to meeting a minimum number of participants. Due to inclement weather or high winds, this tour is subject for cancellation for safety reasons. Tour takes place in Talkeetna.